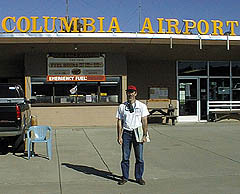 I became interested in flying as a young teenager. I wanted to join the Air Force and learn to fly. Ifound out that Air Force pilots could not wear glasses, so, I changed directons. I returned to my flying goals after raising my daughter and sending her throughcollege. 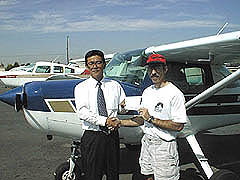 I started my flight training by taking a ground school course at Foothill Community College. I learned there, that it was possible for me to reasonably expect to become a pilot. I then went (with my wife) to try out some "Learn to Fly" specials to see what it actually felt like to pilot an aircraft. I also evaluate the FBOs that we visited. I was looking for a school that had well maintained (and clean) equipment plus stable instructors that would not leave for another position. I also wanted an instructor that could relate to me and my way of learning. And, of course, cost was a factor. 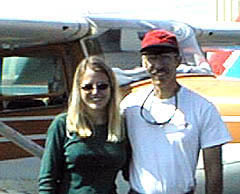 My objectives were to at least solo and, if my training went well, to get my Private Pilot license. My goal now is to find a way to pay for advanced training (Instrument and Commercial) by working at something directly related to flying, if possible. During my training, the most exciting thing I did was to Solo. It was quite a rush! I think the most challenging things for me were stalls (I was a little intimidated by them at first), and unfamiliar airport entries especially a diversion. I'm glad I chose Air Accord for my flight training. My instructor (Yuzo) kept me motivated and challenged. I was able to get lessons when I wanted them. And, most of all, I feel I am a better pilot than I might have been by going to another school. A complete set of english web pages might help bring in more customers. Anything that can help to reduce the costs of learning. Maybe, offer "Advanced" lessons that would help low time pilots gain valuable experience.